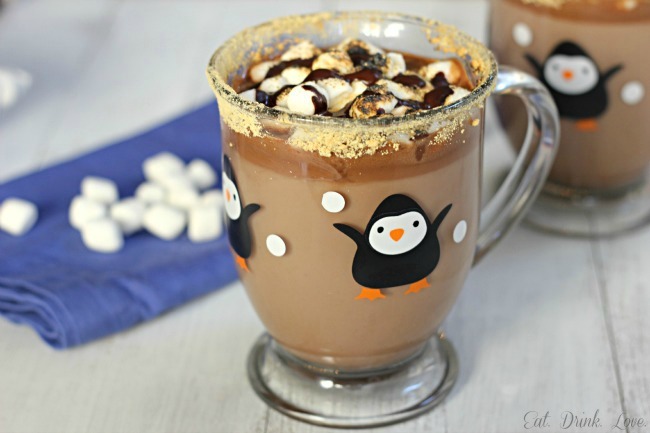 S'mores Hot Chocolate - Eat. Drink. Love. 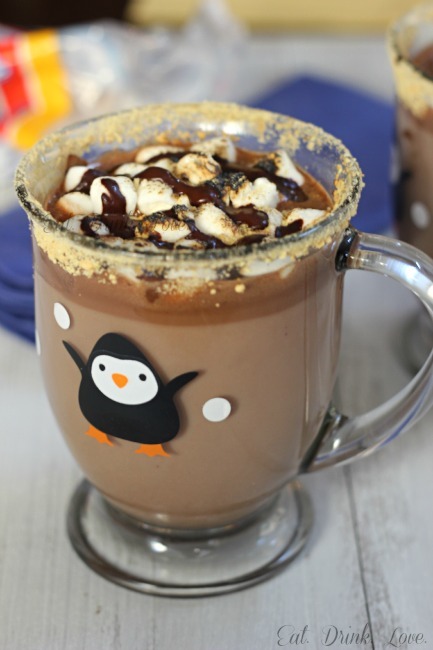 So…S’mores hot chocolate. I don’t know what it is about s’mores, but they just remind me of childhood and summer nights. I didn’t have them all that often when I actually think about it, but I do remember summer nights at my dad’s house in the backyard where we would all sit around and enjoy s’mores. I love summer nights in Ohio. 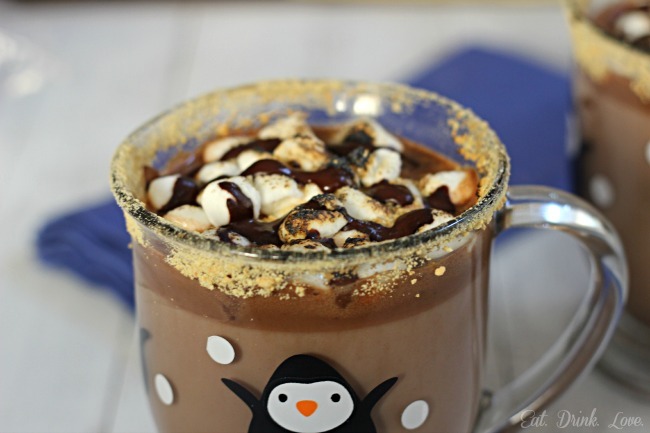 Thought I won’t be spending much time outdoors this winter in Ohio, I can still get my fix with this s’mores hot chocolate! When you think about it, when you make regular hot chocolate and top it with marshmallows, you’re like already three quarters of the way there. Just throw in some graham cracker crumbs and toast those marshmallows and you are done. You’ve got s’mores hot chocolate. So simple. I guess this isn’t really all that inventive, but who cares?! It’s so good. There is something about this version. It’s fancy. So much fancier. Toasted marshmallows might be one of the greatest things ever. I love charred marshmallows. The drizzle of chocolate syrup on graham cracker on top just sets it over the top. 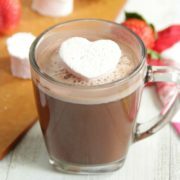 This is my ultimate hot chocolate recipe! If you want to make this more grown-up friendly, add a splash of Kahlua or Bailey’s. Using the 1/4 cup milk, rub some of the milk along the rim of each mug. Pour some graham cracker crumbs onto a plate. Dip the mugs into the crumbs until the rims are well-lined. In a saucepan, heat the remaining milk on medium heat until heated through. Add in the chocolate and whisk until melted. Add sugar to taste. Pour the cocoa into 2 mugs. Sprinkle 1/4 of the marshmallows on top of each mug. Using a kitchen torch, toast the marshmallows until brown. If you don’t have a torch, you can use your broiler. Place the mugs on a baking sheet and broil until the marshmallows are toasted. Drizzle some chocolate syrup over the top and sprinkle with extra graham cracker crumbs if desired. Note: The mugs pictured here are from Pier 1. Thanks, Ramona! The mugs totally make this more fun! First I have to tell you I love the mugs!!! They are happy cups! Your drink sounds amazing! I just love hot chocolate!! I have a serious weakness for s’mores. 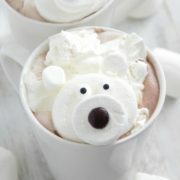 I love that you made a hot chocolate version! MUST give this a try soon!! Those mugs are ADORABLE. 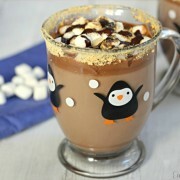 And I love the s’moresy spin on hot cocoa! Hehe, I am glad to see the update with Pier 1. They are so cute! Cute glasses and DIVINE hot chocolate! I like this fancied up version, and I especially like the added booze. Yum! I want this. I want this with and without the Bailey’s but I want this! Awesome! 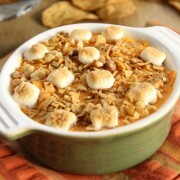 This looks so amazing, I’m so glad I found your website through the cookie swap!